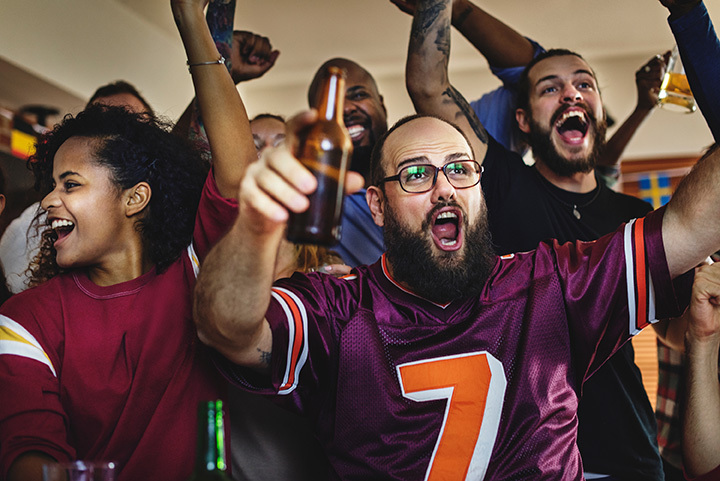 Great sports bars stand out among the rest because of their easy-to-eat bar food, delicious beers, and an atmosphere conducive for hanging with friends and cheering on your squad. In West Virginia, we care about creating the perfect space for watching sports. Here are the 10 best sports bars in the state. If you want great food and fast, friendly service, you’ll want to visit Prime Station in Cross Lanes, West Virginia. From the time you enter the door, you’ll appreciate the homey feeling of the place, and the large selection of food and drink choices will please any hunger or thirst. They offer trivia contests, karaoke, a Ladies Night, and live DJ on weekends, and $1-off appetizers during Happy Hour throughout the week. There are also plenty of large screens TVs for watching your favorite sports team. Barney’s Sports Bar in Charleston, West Virginia, is the place to go if you want to enjoy great food and great services while you watch your favorite game with friends. Mondays and Wednesdays have steak and rib specials, and the whole family can come and enjoy the relaxed atmosphere. Friendly bartenders, the best wings around, and fun make for a great location to watch the game with friends or family. There’s a pool table for friendly competitions, karaoke, and a live DJ on weekends. They serve a grilled pizza that’s a customer favorite and this is a place that you’ll want to visit again. Prices are reasonable, too. Serving everything from massive burgers to zesty gorgonzola truffle fries, the Recovery Sports Bar and Grill has all the amenities one would need to enjoy the game. Take advantage of their Wingman Monday’s when the boneless wings are half price and top off the meal with an ice cold brew from their extensive list of beers on tap. Located inside The Resort at Glad Springs, Bunker Sports Bar & Restaurant is an upscale version of a sports bar. Family friendly and a great way to unwind after a day on the golf course or sightseeing, they have indoor and outside seating available with large plasma TVs, a full bar, and a wide variety of entrees, sandwiches, and salads. You can tell a lot about a place from the bartenders they have and Jasper’s Sports Bar in Martinsburg, West Virginia, gets an A+ for great bartenders. Just a friendly little place with great food and drinks and six flat-paneled TVs, you can grab a bite and watch your best teams play in a relaxed, non-smoking atmosphere. If peanut butter wings and the best Pastina soup sound appealing to you, then you have to visit Basil’s Sports Bar & Grill in Weirton, West Virginia. This isn’t your typical sports bar, and you’ll feel right at home in this family-owned and operated eatery. Grab a burger and enjoy a cold beer while you watch your favorite team play. When you visit Par 500 Sports Grill in Parkersburg, West Virginia, you’ll get more than a front row for your favorite game, you’ll get great traditional bar food that equals or beats any you can find anywhere else. This little hidden gem has reasonable prices, friendly servers, and daily specials. They also have regular events throughout the month, like Paint and Sip. Fans of WVA Mountaineers, the Thundering Herd, and many other sports teams will find their home sweet sports bar here at Spare Time Sports Bar & Grille in Lewisburg, West Virginia. For a lively time, great food, and plenty of large TVs for watching the game, the food isn’t bad either. Top-notch food and a great beer selection make Mountain Mama’s Sports Bar in Morgantown, West Virginia, another one of the Mountain State’s best kept secrets. Try the Hot Mama, a delicious burger that will leave you craving more. Reasonable prices, and fun games to play while you’re waiting for your food or at half-time, they have 17 TVs so you never have to worry about not getting to see your team play.